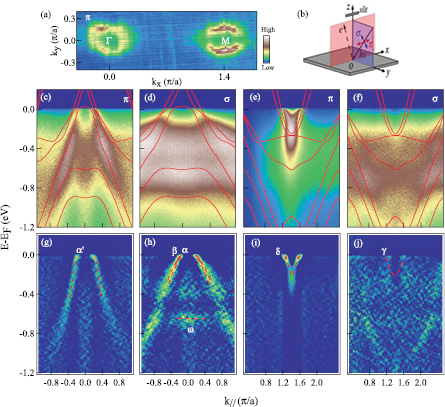 This weeks image comes from a recent Journal of Physics: Condensed Matter paper by Dr Zhonghao Liu et al. They used angle-resolved photoemission spectroscopy paired with band structure calculations to investigate the electronic structure of KFeCoAs2, which is isoelectronic to the Iron based superconductor BaFe2As2. (a) Photoemission intensity map of KFeCoAs2 integrated at EF (±10 meV). (b) Sketch of the experimental polarization setup. The π(σ) geometry refers to the electric fields of the incident photons within (normal to) the mirror plane (pink). We note that our experimental setup for the σ geometry includes a polarization component along z. (c) and (d) Intensity plots of band dispersion at Γ point along ΓM direction in π and σ geometries respectively. (e) and (f) Corresponding to (c) and (d) respectively, but taken at the M point. (g)–(j) The second derivative plots corresponding to (c)–(f). The solid lines in (c)–(f) are un-renormalized LDA-calculated band structures. The dashed lines in (g)–(j) are guides to the eye for the band dispersions. All the data were taken at 1 K with 80 eV photons (kz ~ 0.67π/c). Taken from J. Phys. Cond. Mat. 29 085503, © IOP Publishing, 2017. All rights reserved. Iron based superconductors are of great interest within the condensed matter community, and the exact nature of their electronic structure has been hotly debated. This work shreds valuable light on the global re-normalization and Fermi surface of KFeCoAs2. Orbital characters and electronic correlations in KCo2Se2 by Z H Liu, Y G Zhao, Y Li et al. Angle-resolved photoemission spectroscopy study on iron-based superconductors by Ye Zi-Rong, Zhang Yan, Xie Bin-Ping et al. photoemission spectroscopy investigation by H Ding, K Nakayama, P Richard et al.